Although the people of North Stormont, just south of Ottawa, introduced many new concerns about wind turbine construction and operation –including evidence that has never before been presented at an appeal in Ontario –it wasn’t enough to meet the strategically constructed impossible test set up by the Green Energy Act. The onus is on a community to prove that the power project “will cause” serious harm to human health and “will cause serious and irreversible harm” to the environment. Never mind that the huge turbines will be built on what the province has designated a “highly vulnerable aquifer”. Never mind that some of the turbines could be constructed and operate on unstable soil conditions including Leda or “quick” clay, in an earthquake zone. No seismic evaluations were ordered, or done. Never mind that there are records of thousands of reports of excessive noise, sleep disturbance and adverse health effects filed with the Ontario government. It is a credit to the people of rural Ontario that in the face of moneyed interests, a public service that is still entrenched in the previous Liberal government’s unfounded green energy ideology, and a set-up system stacked against people and communities (to say nothing of the environment), that they continue to fight. 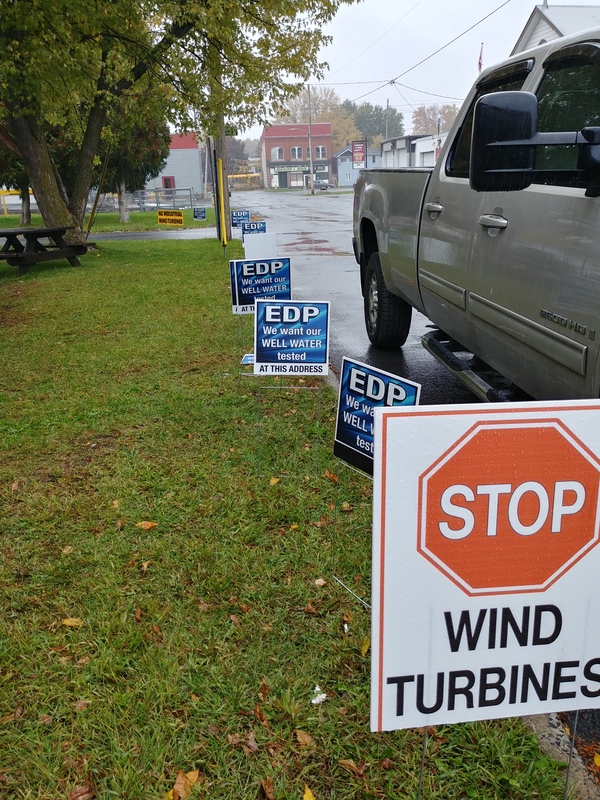 The people of North Kent still want action on the damage done to their water wells; the people of Prince Edward County are still fighting to have an unnecessary and now cancelled wind power project actually removed; the people of Ontario living with turbines continue to file reports of excessive noise, despite government inaction. And the people of North Stormont have vowed to fight on. Or send a cheque to the Concerned Citizens of North Stormont in care of Wind Concerns Ontario, PO Box 509 250 Wellington Main Street, Wellington ON K0K 3L0. “UNEP-led Green Economy Initiative”. Launched late 2008. Has three sets of activities including renewable energy. How some of the present situation came to be? I’m all for green initiatives but the wind industry has been one of the greatest travesties in this province. Five simple terms best describe it: INEFFECTIVE, UNNEEDED, UNWANTED, HARMFUL, and extremely COSTLY. Back to the drawing-board on this one! “International Conference for Renewable Energies”, Bonn, early June, 2004. Articles and articles related to the “International Conference for Renewable Energies” 2004. Can just browse through the articles. This is an information database. Origin and some history. Webpage includes links to more information. A personal, “Thank-you”, to all who have attempted opposition to any windmill project. The disastrous results at some sites is irreversible. Fresh water aquifers cannot be cleaned. Rare species habitat will never return. Beautiful natural areas defiled forever. Families and communities divided. All to add financial riches to the already rich.